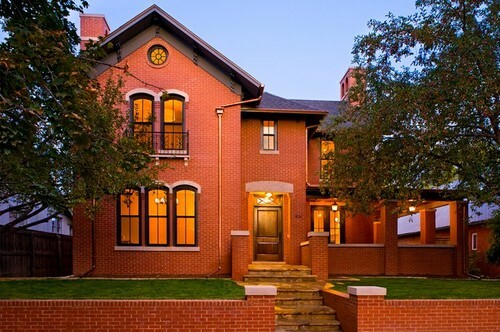 The lintels and large piece above the front door are Colorado sandstone. The large piece weighs about 3,000 pounds; the team used a boom truck to place it. "The stone comes from a local quarry and feels at home," Mattingly says. "It has a gray, almost pinkish, cast that works very well." The bricks are also local. "This house has a quiet presence, and because of the style, it looks like it was one of the original homes that predated the neighborhood," he says. This study is at the front of the house. The husband, Jeff, wanted something dramatic and different for the fireplace, and Mattingly knew that prefab mantels on the market were not going to cut it. He sourced this mantel via Chesney's; it was reclaimed from a castle in Scotland. 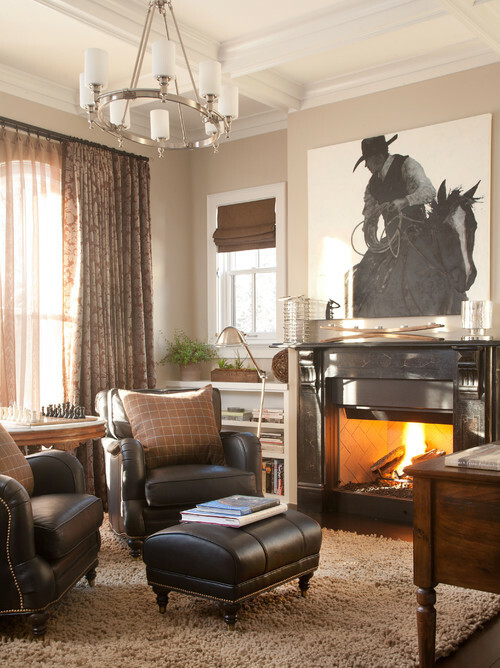 The artwork over the mantel is by local artist Duke Beardsley, who rides out on the range with real cowboys. "Jeff is not really a Western guy, but once I took him to Duke's studio, he had to have this," Mattingly says. The marble-topped side table came from Grandma Esther's inspirational Illinois farmhouse. Jeff wanted a separate Viking refrigerator and freezer, which afforded Mattingly the opportunity to set up a symmetrical kitchen with unique workstations. A wet pantry is just off the kitchen to the left, near the refrigerator; a dry pantry is to the right, near the freezer. "There are three or four unique work triangles formed by this configuration; we planned it out so that people would not get in each other's way while working in the kitchen," the architect says. The artwork shown here on the left is also by Beardsley; each figure is a different hand-drawn cowboy. Beyond the artwork is the butler's pantry, which connects the more public front areas of the home to the more private areas in the back. "Any kind of beverage anyone needs and every type of glass is in this wet pantry," says Mattingly. This means that guests can serve themselves at parties without invading the more private kitchen. The open layout creates a dining space that can be used for casual or formal dining. French doors lead to a patio. The open layout also allows for lots of fresh air — the windows behind the vent hood crank open and allow the breeze to flow in from the French doors. The dining area opens to this living area, delineated by a beautiful coffered ceiling. Leather furniture and a mirror/TV over the mantel keep things low-key, comfortable and family friendly. The floors throughout the home are engineered wood. The master bedroom is a serene retreat. The master bath was begging for this millwork, Mattingly says. The gray walls pick up on the veining in the marble floor. 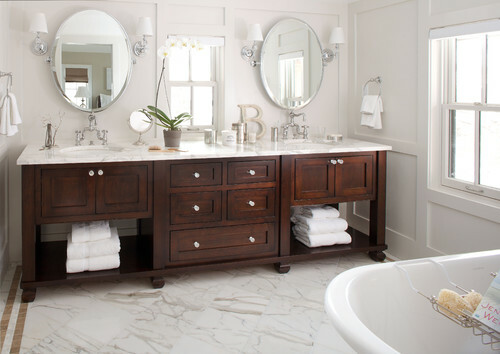 Mattingly designed this vanity to stand up to the large size of the master bathroom. It is 9 feet long and stained a dark walnut, which plays off the gold in the Calacatta marble and the floor's limestone inlay.